That’s the harangue Bernie Sanders’ supporters have been hearing from mainstream bsmocratic Party leaders and their apologists in the media. It’s bound to intensify in the wake of the virtual tie in the Iowa caucuses on February 1 and his projected win in the New Hampshire primary contest. When Dem leaders look at Mr. Sanders, they shudder over the prospect of a repeat of George McGovern’s crushing loss to Richard Nixon. Like Mr. McGovern in 1972, Mr. Sanders is running a populist campaign on a (mostly) progressive platform. The Democratic National Committee is run by corporate-money centrists who believe the only way to defeat a billion-dollar-plus GOP campaign is to field a corporate-money centrist with a billion-dollar-plus war chest. Whatever his public appeal, the corporate PACs and One Percenters who write big campaign checks won’t fund a Sanders campaign and he won’t take their money. Pundits like Paul Krugman and politicians within the party are scolding those who threaten to spoil a Clinton coronation. Barney Frank gave away the game in July when he published an essay in Politico revealing that Dem leaders consider Mr. Sanders a nuisance and an interloper. Mr. Frank shuddered at the thought of contested primaries, a half year before they began. “Bernie will win the nomination if enough of us vote for him!” cry the faithful. Maybe, but the Democratic Party establishment has ways to work its will. It enacted a superdelegate system after the McGovern disaster to minimize the influence of rank-and-file Dems and ensure a nominee approved by party leaders. If he survives the primaries, Mr. Sanders will need a supermajority at the convention to take the nomination. 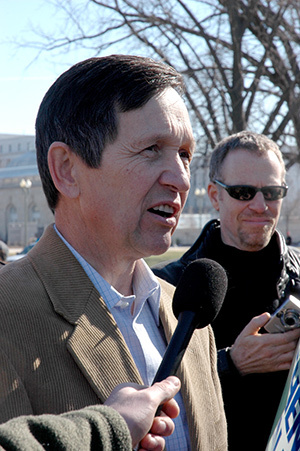 Bernie Sanders has surpassed the efforts of previous progressive challengers like Dennis Kucinich. His record as U.S. Senator is excellent on many issues, good on some, and wrong-headed on military spending and certain areas of foreign policy. He opposed the invasion of Iraq but subsequently voted for war funding. My purpose here isn’t to assess Mr. Sanders or his campaign. A critique of his platform is hardly going to lure Sandernistas away from him. Mr. Sanders’ informed supporters already know of his weaknesses on some issues. They’re remaining loyal to their candidate in the face of DNC hostility towards him. Will the Sanders insurgency grow or will everything snap back to business as usual in the coming months? What will Bernie Sanders’ supporters do if the Clinton Juggernaut crushes him between now and mid summer? 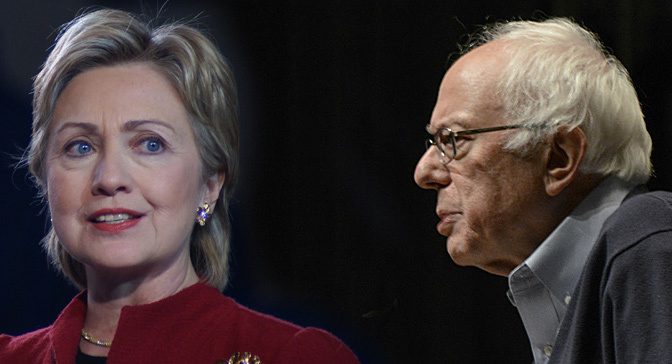 They’ll be faced with a choice: migrate over to the Clinton camp or find a way to keep alive the political revolution that Mr. Sanders claims to represent throughout the rest of 2016 and thereafter. If Mr. Sanders is bounced from the race, all the best things he stands for will be banished from public discussion in the contest between Ms. Clinton and the Republican nominee. Political revolution can’t be reconciled with support for Hillary Clinton, given her history as First Lady, U.S. Senator from New York, and Secretary of State. The only reasons to vote for her are either lesser-evil pragmatism (“We can’t allow a GOP victory”) or delusion (“I believe that, deep inside, Hillary is really on our side”). Mr. Sanders himself has promised to throw his support to the Dem nominee. It’s true that a vote for Ms. Clinton will help prevent a Republican from moving into the White House. But the effect of perpetual lesser-evil voting is that Democrats know they can perpetually take one’s votes for granted, regardless of what they do in office. The insistence in every election on support for the lesser evil instead of other options has made voters who call themselves liberal and progressive complicit in the country’s bipartisan slide to the right. Bernie Sanders’ defeat should be an epiphany, a final nail in the coffin for the idea that change is possible as long as the political landscape is limited to two corporate-money parties. It’s more likely that Medicare For All, restoring Glass-Steagall, and other goals of the political revolution will get kicked to the curb. (Medicare For All and Glass-Steagall are hardly revolutionary, but that’s another story.) Liberals and progressives have a dismal record in pursuing their own agenda when Dems get elected. Bill Clinton’s election in 1992 turned liberal advocacy groups into groupies who fawned over him while he betrayed them one by one. Barack Obama’s victory in 2008 killed the mass antiwar movement. No movement helps itself by retreating into support — or passive acceptance or nonvoting acquiescence — for a candidate who’s hostile to the movement’s agenda. Some dedicated advocates of Medicare For All, breaking up megabanks, ending the war on drugs and mass incarceration, the rights of immigrants, etc. will continue the fight, just as serious peace activists continued to protest President Obama’s civilian-slaughtering drone warfare and invasion of Libya. But most will celebrate a Clinton victory and kiss political revolution goodbye. What will there be to celebrate, beyond the election of the country’s first woman to the White House? Margaret Thatcher’s tenure as prime minister should warn us against overstating the symbolism of such victories. (1) A Clinton Administration will mean more business as usual, a lot like the Obama Administration but more shameless about its allegiances to the financial sector, Big Oil, and other powerful lobbies. Lesser-evil voting, by definition, has never been more than a stopgap to fend off the GOP horde. It has become a dangerous trap. Neither Ds nor Rs are capable of adequately addressing the crises of the 21st century: climate change; concentration of wealth and power among the One Percent, shrinking of the middle class, and shredding of the social safety net for the poor; a growing national-security mass-incarceration state; endless war. The difference between a Clinton presidency and a Trump or Cruz or Rubio presidency is the difference between driving towards a cliff at 55 mph and driving towards a cliff at 90 mph. The Sanders campaign has raised hopes that these crises can still be solved. But real change requires thinking beyond an individual campaign. The tendency of progressives to place all their eggs in the Democratic basket and all their hopes in single charismatic leaders has prevented insurgent movements from gaining momentum. Political revolution requires changing the landscape so that the field isn’t forever limited to the two parties of war and Wall Street. It means banishing the fantasy that one of the two parties can be rehabilitated if we just vote for the right Democrat. 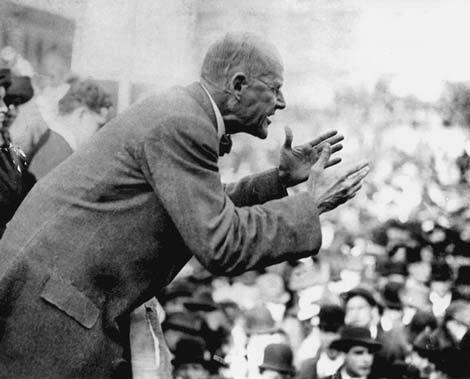 One hundred years ago, Eugene Debs and his fellow socialists understood that the crises of the time demanded an independent movement with a strong electoral component. The parties they organized had enormous influence, even though they didn’t survive laws enacted by D and R legislators to weaken alternative parties and Cold War hostility towards the left. The New Deal was based on ideas advocated decades earlier by socialists and others outside the two-party establishment. President Roosevelt knew he had to enact them during the Depression or he’d see a mass exodus from the Democratic Party. The legacy of alternative parties in the U.S. includes abolition of slavery, women’s suffrage, the eight-hour workday, workers’ benefits, public schools, unemployment compensation, the minimum wage, child labor laws, direct election of senators, and programs like Social Security and Medicare. All of these were introduced by alternative parties and adopted decades later by one or both of the major parties. The virtual disappearance of such ideas in the last few generations is one of the great unmentioned reasons for the triumph of the right wing in U.S. politics. When the two corporate-money parties were left alone on the field to be each other’s sole competition, it was inevitable that they’d slide to the right. While sharp differences exist between Ds and Rs, their leaders tend to agree on premises: privatization and “free trade” globalization are good for America; no health-care reform is permissable unless insurance companies help draft the legislation; the U.S. may attack any country at will, even in the absence of provocation; too-big-to-fail banks must never suffer punishment for their criminal recklessness, or even face adequate restraints. Genuine systematic change is always called unrealistic and too radical to be taken seriously, as the political mainstream’s critical onslaught against Bernie Sanders proves. The history of progress in the cause of justice and freedom in the U.S. is the history of parties whose ideas were both marginal and indispensible. An effective alternative party is one that builds its base of support among those who’ve seen their ideals betrayed and rejected by the two major parties, by those who’ve realized that neither of the two big parties serve their needs, and by those whose alienation from the two parties has kept them away from voting booths. It engages working people and people of color in a way that enables them to represent their own interests and encourages their leadership within the party. It runs candidates at all levels, from school board to city hall to statehouse to Congress to the White House. Alt-party presidential candidates use their campaigns to carry the banner for popular movements and for state and local candidates. Green Party nominees since Ralph Nader in 2000 have all promoted down-ticket Green candidates (some of whom have won) and helped state parties achieve ballot status. In 2012, Jill Stein’s campaign assisted Green ballot-access efforts in enough states (37 including the District of Columbia) to place her name in front of 82% of voters in the November election. Green, Libertarian, and other alt-party contenders have overcome the prohibitively difficult ballot-access requirements designed by D and R legislators to privilege their own candidates and hinder others. Voting for an alt-party presidential nominee pushes the party forward regardless of his or her chances of winning the White House. The Green Party and its national candidates support Medicare For All and will continue to do so long after the summer conventions and Election Day. The demand for national health care is too important to let die after July 2016. We’ll only win it with a persistent citizens’ movement combined with the election of Congress members willing to vote for it. Democrats in Congress, even those who say they support it, have little motivation to enact Medicare For All as long as Republicans are their only competition during election years. The two major parties and their One Percent sponsors fear, more than anything else, permanent and well-organized alt-party competition. They have nightmares about finding new parties seated in legislatures. Bernie Sanders, a self-declared socialist elected to the U.S. Senate as an independent, knows the importance of alternative parties. But his decision to seek the Dem nomination precludes him from uttering a positive word about them. The future doesn’t depend on Bernie Sanders. It depends on all of us who support political revolution and what we do after his campaign is history. Do we want to change the country’s direction or are we content to rubberstamp the political status quo every Election Day? If the former, then it’s imperative that we build an alternative party now, before the consequences of two-party rule become irreversible. (2) See the rebuttal from Physicians for a National Health Program. (3) There are currently two law suits against the CPD in which alternative parties are among the plaintiffs: click here and here. Scott McLarty has served as media coordinator for the Green Party of the United States and for the DC Statehood Green Party. 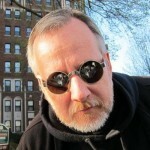 He has had articles, guest columns, and book reviews published in Roll Call, CommonDreams.org, Z Magazine, Green Horizon, The Progressive Review, In These Times, and several local and community publications and small press. He joined the Green Party in 1996, and in 1998 ran for the Ward 1 seat on the Washington, DC City Council. Mr. McLarty grew up in Long Island, New York, and now lives in Washington, DC.